Free Download RealTimes (previously known as RealPlayer) latest version. RealTimes has all features of RealPlayer 16 and RealPlayer Cloud. RealTimes provides you the powerful new cloud video service on mobile and TV. 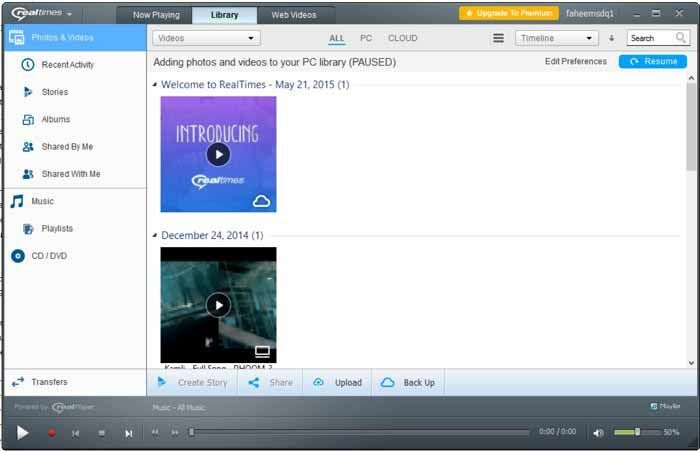 RealPlayer Cloud lets you create an online storage hub for your videos, whether they started life on your phone or PC. Once saved online, you can access your videos from anywhere via the RealPlayer Cloud App. Accounts come with 2GB of free storage. RealPlayer Cloud works with Roku and Chromecast to stream your videos directly from your PC or smartphone to your TV. No wires required! With RealPlayer Cloud, send videos privately to family or friends straight from the RealPlayer Cloud App without having to share them on Facebook or YouTube. Friends receive a web-link to easily watch the video on any computer or mobile device. Free Download Real Player, by RealNetworks, it is a cross-platform software product primarily used for the playing of recorded media. The media player is compatible with numerous formats within the multimedia realm, including MP3, MPEG-4, QuickTime, Windows Media, and multiple versions (proprietary) of RealAudio and RealVideo formats. When you start realplayer cloud after installation, it will require you login or create account. This will use to use your RealPlayer cloud service free. After logged in, it will start to add your media into realplayer cloud. It does not mean that this upload all media, it just scan and add into media library withing your PC. You will see various options at the left side of the window. You can see PC Library and RealPlayer Cloud with various sub directories. RealPlayer Cloud for Windows Desktop still has this great feature. Download videos when browsing sites like YouTube, Daily Motion and thousands more with a single click. Automatically save them online in RealPlayer Cloud to watch them later on your mobile devices. Store your videos securely and privately in your own personal cloud. We ensure that no matter what the format, they’ll be ready to play on any device. RealPlayer Cloud is the new & updated version of your favourite media player.